Krishna Kanta Handique Govt. Sanskrit College. Essential Qualification (From 1 to 9) : HSLC or Equivalent Examination Pass. Age : Candidates as on 1.1.18 is to be 18 years to 43 years and upto 5 years relaxation for reserved category. How to apply: The eligible candidate is to send their application on or before 31st December, 2017 addressing :- Principal, K. K. Handique Govt. Sanskrit College, Jalukbari, Guwahati-14. 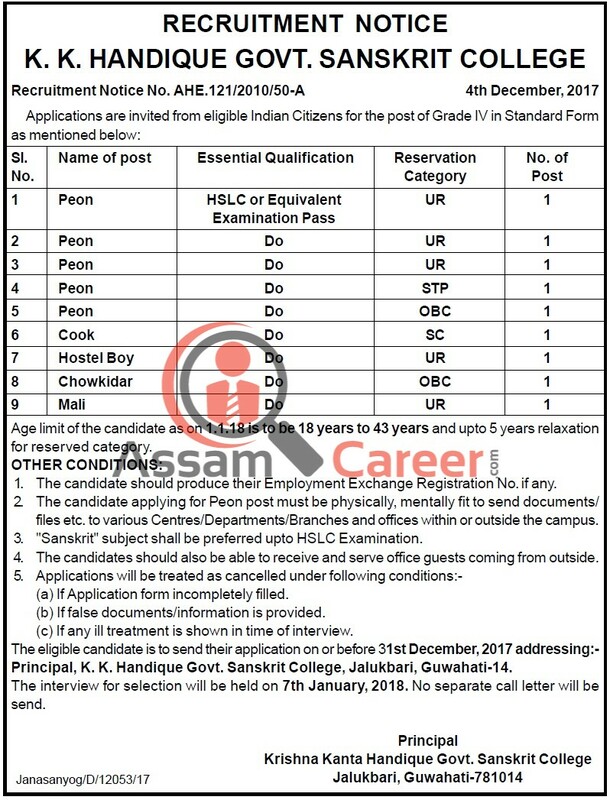 The interview for selection will be held on 7th January, 2018. No separate call letter will be send. 1. The candidate should produce their Employment Exchange Registration No. if any. 2. The candidate applying for Peon post must be physically, mentally fit to send documents/ files etc. to various Centres/Departments/Branches and offices within or outside the campus. 3. "Sanskrit" subject shall be preferred upto HSLC Examination. 4. The candidates should also be able to receive and serve office guests coming from outside. (a) If Application form incompletely filled. (b) If false documents/information is provided. (c) If any ill treatment is shown in time of interview.